Salinization is a critical hazard for plants, particularly agricultural crops in irrigated and salty regions of the globe. Production of all field crops is drastically reduced by salinity. Consequently, to ensure food safety it is essential to control salt stress if an optimum crop yield is to be obtained under saline soil conditions. Characterization and evaluation of physical, biological, and genetic features play important roles in the cultivation of various crops in salty conditions. Furthermore, information about the association between these properties is important to resolve salt stress and attain an optimum crop yield. 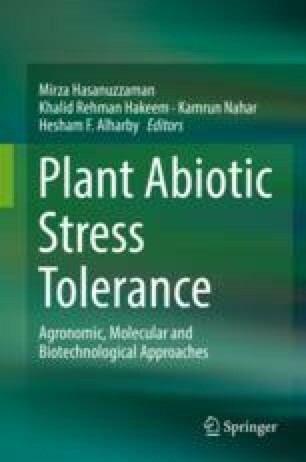 This chapter discusses the responses of plants to salinity stress through physical, biological, and DNA changes and their adaptations to saline conditions through osmoregulation, ion homeostasis, apoplastic acidification, production of various antioxidants, gene expression, hormonal activities, and production of stress response proteins. In the near future, more research will need to be done, focusing on approaches including refinement or breeding for evaluation of salt-tolerant germplasms, use of different DNA-based marker systems for selection of salt-tolerant cultivars, capabilities for genetic transformation to achieve salinity resistance, and excellent nutrient supervision, as well as seed-priming practices for viable or excellent production with high yields in different saline settings. Conclusively, salt stress affects plant metabolism and the physiology of plants, and it drastically reduces the crop yield. Consequently, production of salt-tolerant germplasms might remain a judicious approach to accomplish adaptation to salinity. Intensive exploration work on combinations of several control practices may lead to excellent crop yields in saline soils that could contribute significantly and efficiently to food security all over the world.